Roffey (108-0) extended their lead at the top of the Premier Division with a comprehensive 10-wicket win over Hastings and St Leonards Priory (105 all out). Alex Collins was the star with the ball for Roffey taking 5-25 while Rohit Jagota took 3-18. Theo Rivers (55 not out) and Jagota (44 not out) saw the league leaders to the victory. Second-placed Brighton and Hove (233-7) settled for a draw against Horsham (273-8). Craig Gallagher (79) and Nick Oxley (68) top-scored for Horsham while Simon Hetherton took 4-64. Phil Salt was Brighton’s top scorer in reply with 94. Bowlers dominated as the reigning champions East Grinstead (136 all out) beat Ifield (85 all out). James Pearce (6-67) was the pick of the Ifield bowlers while Ian Sturmer (6-33) and Lewis Hatchett (4-38) starred for East Grinstead. Eastbourne (2094) enjoyed a six wicket win away at Middleton (200 all out). Mahesh Rawat hit an unbeaten 100 for Middleton while Eastbourne skipper Jacob Smith (75) lead the way in his side’s reply. Cuckfield (168-9) managed to hold on to a draw against Preston Nomads (254-6). Dan Phillips (90) and Stuart Faith (63) were the mainstays of the Nomads’ innings. Navin Patel (4-81) and Adam O’Brien (4-27) were the pick of the Nomads bowlers. Billingshurst (208-7) went top of Division 2 with an 104-run with against Bognor Regis (104 all out). Tim Weston (76 not out) was Billingshurst’s top scorer before Ben Williams (3-7) and Andy Barr (3-15) shone with the ball. Haywards Heath (185-2) beat Lindfield (182-8) by eight wickets with Jonny Phelps putting in a superb all round performance taking 3-42 and scoring an unbeaten 102. Alastair Templeton contributed with 52 not out in the run chase. Callum Parker scored unbeaten 96 for Lindfield. Nisal Francisco hit a brilliant unbeaten 159 as Mayfield (287-4) drew with Three Bridges (228-9). David Winn hit 72 in the reply as Bridges held on for a draw despite the efforts of James Allen (5-68). Bexhill (104 all out) picked up their first win of the season in a low-scoring affair with St James’s Montefiore (74 all out). Sam Rattle took 4-34 for St James’s while Nick Peters starred with 5-21 for Bexhill. Ansty (210-7) drew with Chichester Priory Park (171-6). Christopher Barnes (93 not out) and Jethro Menzies (72) top scored for Ansty while Sam Caldera was the mainstay of the Chichester reply. Division 3 West: Findon 226-8 (53.0) beat Slinfold 120 all out; Goring By Sea 142 all out lost Pagham 148 all out; Steyning 263-6 beat Roffey 2nd XI 169 all out; Stirlands 148-8 drew with Worthing 210-9; Three Bridges 2nd XI 177 all out lost to West Chiltington & Thakeham 259-7 dec. Highlights: Liam Freeman took 6-43 for Findon; Justin Scott took 5-56 for Pagham; Ben Lucking took 6-15 for West Chiltington and Thakeham. Division 3 East: Brighton & Hove 2nd XI 242-8 beat Preston Nomads 2nd XI 228 all out; Eastbourne 2nd XI 253-6 dec beat Bexhill 2nd XI 202 all out; Hastings & St Leonards Priory2nd XI 187 all out lost to Burgess Hill 226-8; Portslade 148-4 beat Crawley Eagles 144 all out; Seaford 176 all out drew with East Grinstead 2nd XI 176-8. 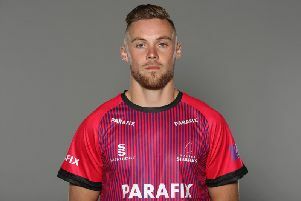 Highlights: Matthew Smith 106 not out for Brighton; Luke Tomsett 100 not out and Ben Barter 5-60 for Eastbourne; Dan Strange 6-55 for Burgess Hill.